Native to the lower Mekong river running through Thailand, Laos, Cambodia and Vietnam. It’s also found in the Chao Phraya river in Thailand. Inhabits sluggish streams and tributaries. It lurks among submerged tree roots and other refuges during daylight hours, emerging at night to feed. A single specimen would be fine in a standard 48″ x 12″ x 12″ (120cm x 30cm x 30cm) – 108 litre tank. Something with a much larger footprint would be needed for a group. It’s a shy, nocturnal species so it’s best to keep the tank dimly lit. Provide plenty of hiding places using upturned flowerpots, lengths of plastic piping, tangles driftwood etc. Plants aren’t essential but are useful in cutting out the amount of light hitting the bottom of the tank and providing extra cover. If you’re keeping it alongside other similarly-sized catfish, or as a species group, arrange the decor to form distinct territories. Try to position the heater in such a way that the fish will not be tempted to rest under it, as it’s a scaleless species and will burn easily. pH: 5.8 to 7.8. Does best in acidic conditions. It should not be fed the meat of mammals such as beef heart or chicken. Some of the lipids contained in these meats cannot be properly metabolised by the fish, and can cause excess deposits of fat and even organ degeneration. Similarly there is no benefit in the use of ‘feeder’ fish such as livebearers or other small fish. Risks involved with feeding these include the potential of disease introduction. It will eat any tankmates small enough to be considered food, but can be safely housed with larger species that inhabit other areas of the tank. Ideal choices are medium to large-sized cyprinids, characins and peaceful cichlids. It’s territorial towards other bottom-dwellers though, especially conspecifics. It should only be combined with such species in a suitably sized tank with plenty of hiding places and broken lines of sight. Females generally have a stockier profile than males. Males possess a noticeable, elongate genital papilla and the light markings on the body are usually more intense than in females. Unreported in the hobby. Spawning occurs at the onset of the wet season in nature. This species was formerly included in the genus Leiocassis, and is still referred to as such in a great deal of the available literature. The current genus Pseudomystus contains many similarly patterned species, some of which may be being imported and sold as P. siamensis. Its commonly encountered congener is P. stenomus, but this can be plainly distinguished by its lack of “bumblebee” patterning. 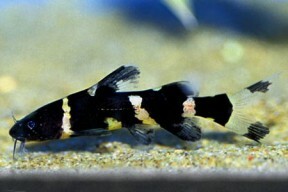 The Asian bumblebee can also be easily told apart from the South American Pimelodid “bumbebee” catfish by the pair of nasal barbels located just in front of the eyes.